The Auditor General’s report raises key issues to be considered by the NSW Housing Inquiry and those making submissions. The NSW parliament is currently conducting an inquiry into social, public and affordable housing, noting the recommendations of the 2013 report of the Audit Office of New South Wales entitled Making the best use of Public Housing. It is estimated that all social housing only meets 44 per cent of need in New South Wales. Housing NSW (HNSW) projected that for social housing to continue to meet the same level of need (i.e. 44 per cent of need) in 2021 it would require an additional 2,500 social housing dwellings per annum and cost more than $9 billion over 10 years. Land and Housing Corporation (LAHC) has been disposing of more properties than it has added in recent years (except during the National Economic Stimulus Building years 2009 to 2012). LAHC sells public housing properties to meet operating cost shortfalls, disposing of properties each year. 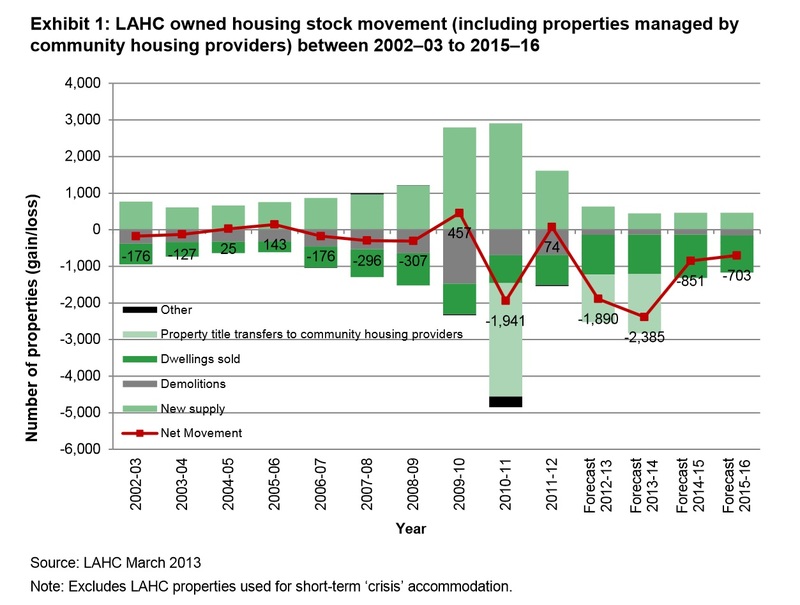 LAHC reported that from 2003-04 to 2011-2012 the sale of over 5,500 dwellings has raised $1.2 billion, and projects that it will be disposing of more than double the number of properties it builds over the next four years (see table below showing net movement of LAHC owned stock). LAHC’s public housing portfolio was worth approximately $32 billion in 2012 and could have notionally generated market rent income of around $1.5 billion. However, nearly $860 million was forgone to fund rental rebates to public housing tenants. LAHC reports that a continuation of current strategies will see the portfolio decline over time in terms of dwelling numbers and standard. This will have a negative impact it suggests by increasing the level of complaints about the standard of public housing. Without change, it is likely that public housing will either run down or be sold off. With demand outstripping supply to such an extent, what are the priorities for housing people while remaining sustainable both financially and socially? What is the appropriate model of ownership, LAHC or community housing providers or a mix, and if so, what is the best mix? With costs growing and revenue declining, can revenue be increased? These are some of the big issues the Inquiry should address. Details on how you can make a submission and have your voice heard can be found in Select Committee on Social, Public and Affordable Housing! David White is the Tenant Participation Resource Services (TRPS) Worker at ISRC.